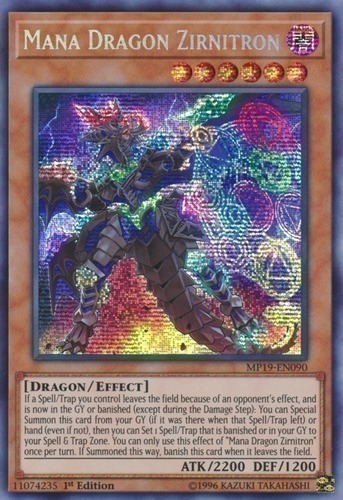 If a Spell/Trap you control leaves the field because of an opponent's effect, and is now in the GY or banished (except during the Damage Step): You can Special Summon this card from your GY (if it was there when that Spell/Trap left) or hand (even if not), then you can Set 1 Spell/Trap that is banished or in your GY to your Spell & Trap Zone. You can only use this effect of "Mana Dragon Zirnitron" once per turn. If Summoned this way, banish this card when it leaves the field.